"iView MediaPro" is a convenient catalog tool. PhotoFlush for EM NegaScan is now getting older and does not compatible with recent image format, thus it is better to use iView MediaPro for general purpose. "Make Folder Cat" is the tool which can automate to create a folder catalog using iView MediaPro. 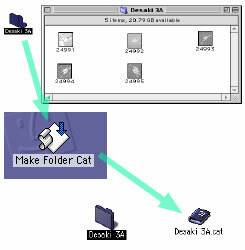 Drug and Drop the folder icon on Make Folder Cat, then the new catalog file will be made. At the lower left coner of the Media Window, there is a menu to select the mode for enlargement. On the left top corner of Thumbneil or Media Window, there is an application menu to edit the selected image. When you choose "Adobe Photoshop", you can open the original image file by Photoshop.